Invade Bio Drain Treatment Gel is a blend of beneficial microbes and natural citrus oil in a thickened formula to coat the sides of drains. Invade Bio Drain Treatment Gel will eat through the scum in drains to stop fruit, drain, phorid, eliminating them at the source. May be used in kitchens, bakeries,hospitals,restaurants and food processors. InVade Bio Drain Gel contains microbes that eliminate odors and eat through scum, and citrus oil for extra power. The oil has insecticidal activity and smells like fresh oranges. Moisten drain with warm water(1-2 gal) before treatment if not used regularly. Drain odors will quickly be eliminated when InVade Bio Drain is in use. May also be used in soda fountains drip tray to prevent or minimize "sugar snake". Apply 4 oz. to each drain around the edges to coat the sides. Repeat daily for 5-7 days and then everty 1-2 weeks for ongoing maintenance. For drains that have a very heavy layer of scum, clean the drain with a brush before beginning treatment for immediate results and then maintain with Invade Bio Drain to prevent further build up. Eating the Scum of the Earth! Microbial Blend: The microbes used in InVade Bio products are a multiple spore blend designed to provide exceptional performance over a wide range of organic waste-related applications, including drain line and grease trap treatment, hard surface cleaning and deodorizing, septic and waste treatment, and carpet and fabric care. The strains were selected for their superior enzymatic activity against specific substrates including proteins, carbohydrates, and fats. Their combined synergistic value is demonstrated in enhanced cell growth, germination rate and effectiveness over a wide range of organic substrates. They will perform in both aerobic and anaerobic environments. Spore-formed microbes are superior in that they are more resistant to chemical cleaning agents. When the spores are in contact with their food source (the target organic matter), they generate bacterial colonies. These bacteria then digest organic matter. While the bacteria can be killed by chemicals, the spores survive and can again produce bacterial colonies when conditions become favorable (e.g. the chemical is rinsed away). The spores consist of Bacillus strains (multiple), with no detectable Salmonella or Shigella. Strains are included which produce Lipase, Protease, Amylase, Cellulase and Urease enzymes with aerobic and facultative anaerobic pathways. Invade Bio Zap : Ready-to-Use Liquid for Quickly Eliminating Organic Odors, Excrement, Organic Waste and Fly Breeding Sites. InVade Bio Zap is an extremely versatile, ready-to-use microbial liquid. InVade Bio Remediation: Super-Concentrated Microbes for Grease Trap Maintenance and Other Bio Remediation Applications. OxivirTb RTU KILLS MRSA in one minute! 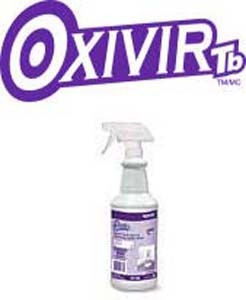 OxivirTb - One Step Ready-To-Use Disinfectant Cleaner Kills MRSA - in one minute! Virex Tb Ready-To-Use - formula provides excellent cleaning, disinfecting and deodorizing in one simple step. Kills MRSA! 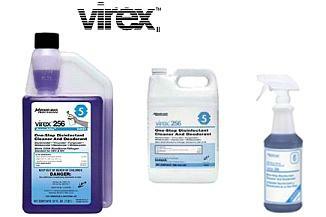 Virex II 256 - One Step Disinfectant Cleaner & Deodorant. Kills MRSA! The Fogmaster jr is constructed of corrosion resistant materials. It's easy to use. Twist the power head to detach the tank and pour in your solution. Another half twist and you're ready to go. Switch on the handle to run. Adjust output size, from a fine light fog to a coarse mist, with the rotary valve. The multi-range Tornado ULV fogger offers a 3 gallon formulation tank, large filter with cleanable screen and precision control metering valve that allows adjustable outputs from a heavy mist of 5 gallons per hour, down to low outputs in the ULV range. Ideal for humidification in greenhouses, general pest control and other application. Included with each machine is a unique Curtis Viscometer, which is used to measure the viscosity of your chemicals. The viscosity measurement is then matched to a chart provided in the manual to give precise control valve settings for particle size and formulation output. This assures less waste of chemicals and proper compliance with chemical label requirements.